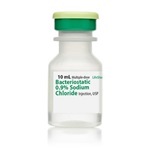 Sterile Sodium Chloride 0.9%, in a 5mL single dose dropperette. Preservative free. 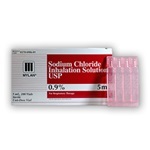 Inhalation respiratory therapy solution. Manufactured by Mylan Pharmaceuticals. NDC Number: 00378-6986-01. Comes 100 per box. 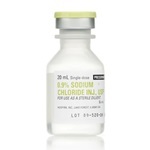 Sterile Bacteriostatic Sodium Chloride 0.9%, in a 10mL multiple dose vial with light green LifeShield plastic flip-top. Intramuscular, intravenous, or subcutaneous injection. Manufactured by Hospira. NDC Number: 00409-1966-12. Comes 25 vials per box. **THIS ITEM IS CURRENTLY ON BACKORDER. 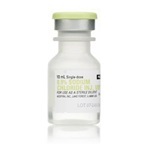 ** Sterile Bacteriostatic Sodium Chloride 0.9%, in a 10mL multiple dose vial with light green LifeShield plastic flip-top. Intramuscular, intravenous, or subcutaneous injection. Manufactured by Hospira. NDC Number: 00409-1966-12. Comes 25 vials per box. **THIS ITEM IS CURRENTLY ON BACKORDER. 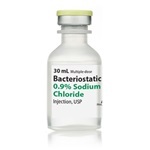 ** Sterile Bacteriostatic Sodium Chloride 0.9%, in a 30mL multiple dose vial with light green plastic flip-top. Intramuscular, intravenous, or subcutaneous injection. Manufactured by Hospira. NDC Number: 00409-1966-07. Comes 25 vials per box.